I can’t believe it! I am getting ready to go to my very first NCECA conference, in Milwaukee WI next week. I have wanted to go for years. This year is the year. Hi. My name is Kathy Maves. I am a potter originally from Elk Mound, Wisconsin which is about an hour and a half east of Minneapolis/St. Paul, Minnesota. I am in my second of three years in the ceramics MFA program at Southern Illinois University Carbondale. Currently, I make slipware pottery using computer and hand cut stencils and decals. This year’s NCECA is practically in my backyard. I am looking forward to learning a lot, seeing old friends, and meeting new people. 9am-1pm: Check in to the exhibition hall and help set up the SIUC table in the Resource Hall (Hall A.) Drop off a cup for the 22nd Annual Cup Sale (Room 201 A-B.) Roam and attend Gallery Expo talks. 1-5pm: Hang out at the SIUC table in the resource hall. 6pm-7pm: NCECA for New Members by Cindy Bracker (102 A-C) This introduction will save a lot of hassle later. Evening: Start visiting some of the exhibitions around town. 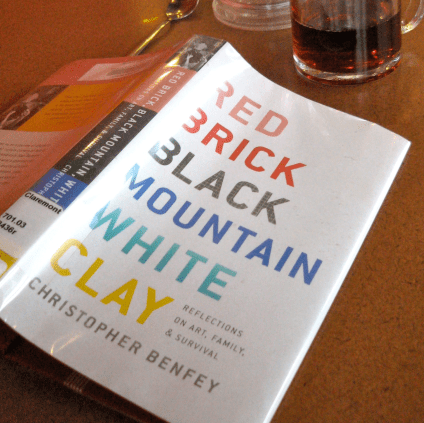 8-9:30am: Roundtable Discussion: Handle as Bridge: Creativity, Learning, and Purpose (Ballroom C) This roundtable springs from a great quote from the popular book RED BRICK BLACK MOUNTAIN WHITE CLAY which I thoroughly enjoyed reading the summer before I started grad school. A must-read for the ceramics or history buff. 5-9pm: Flow, bus tour of exhibitions. (Route B Central) For me, the highlight of this tour may be seeing new wood-fired work by some of my favorite Wisconsin potters at the Frank Sadler Gallery. It is a must-see show on my list! 10:45-11:45am: 50 Friends: a Platform to Discuss Digital Communities with Cindy Bracker (102 E) I will be there to learn more about my blogging on crafthaus and NCECA. 3:15-4:45pm: Panel: Where Are the Studio Potter’s? by Mary Ann Steggles(m), Tony Clennell, Lisa Hammond, Mark Hewitt. I am hoping to hear Lisa Hammond talk about her efforts towards a pottery apprenticeship program in England. 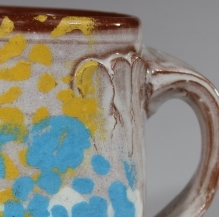 5-6:00pm: Using a Die Cutter for Ceramics by Linda Arbuckle. This shop-talk group may easily be my most important hour at NCECA, since I am working with the same technologies. 8:30-11am: Merchandise Sales in the Main Lobby ends at 11 today. 10:35-11:35am: Closing Lecture: A Passion for Clay by Cynthia Bringle. I am so excited to be able to hear her speak! My schedule is much more detailed than this. To make it all possible, I will be driving so that I can visit galleries as my schedule allows. Plus, I will be able to spend as much time as I need to see the work. My favorite line of this year’s conference theme, Material World was; “While we make things, things have the ability to make us as well, influencing our understanding of place, time and culture.” At this next NCECA, material will be interpreted in a vast display of approaches. It will all be very new. Still, it reminds me of something old. In the 1949 Winter Craft Horizons Anni Albers wrote on materials. It is better that the material speaks than that we speak ourselves…if we want to get the sense of directness, the adventure of being close to the stuff the world is made of, we have to go back to the material itself, to its original state, and from there on partake in its states of change…Free experimentation here can result in the fulfillment of an inner urge to give form and to give permanence to ideas… But most important to one’s own growth is to see oneself leave the safe ground of accepted conventions and to find oneself alone and self-dependent. For me, 65 years later, her ideas still resonate. I am looking forward to seeing a lot of free experimentation. NCECA is going to be a blast!